IT'S THE END OF NATIONAL PIE WEEK. And on account of that, Mathew's love for all things pastry topped and next week being host to St Patricks day, I decided to revisit and tweak one of my old recipes. Cooking the large chunks of feather steak in Guinness until tender creates a deep, dark and intense liqour, which is made richer by using Worcestershire sauce, and some brown sugar and salt to counter the bitterness the stout creates. 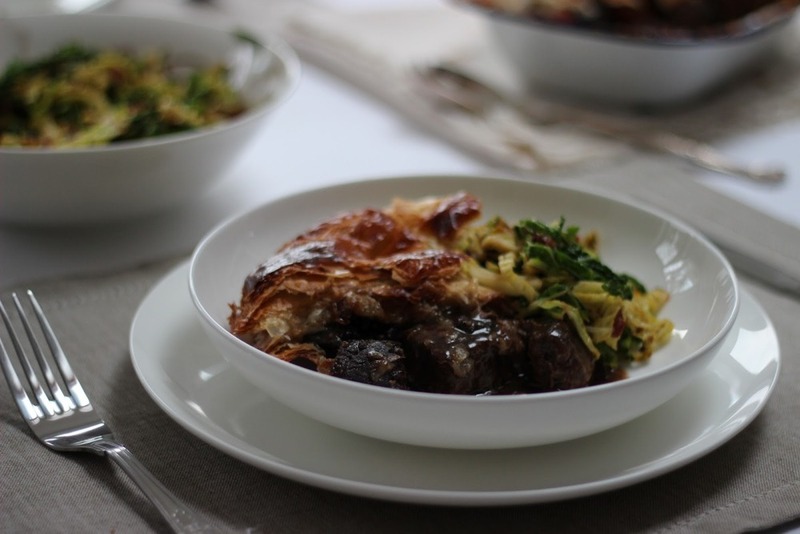 That, added to the chunks of black pudding that soften gently in the sauce, creates a pie that is rich and delicious. I popped the filling into the slow cooker this morning and made myself scarce for three hours. With that trusty bit of kitchen kit working its magic I could go off and do other things – not to mention avoid the smell of the filling from driving me mad (patience has never been a strong point of mine). I chose to make the pie with a puff pastry lid and base. Doing the base is a little scary because as it puff it pops right up, but fear not, it will settle down back into the tin once it’s been blind baked, ready to take the filling. The benefit of doing the base is it becomes incredibly crispy and unctuous under the filling on account of it being baked twice, prepare for it being a bit of the pie people will be fighting over. Serve the pie with whatever takes your fancy, but I chose some fantastic smoked streaky bacon from my favourite butcher (Wrights in Carrington, Nottingham) finely diced and fried on a high heat in a dry pan until crisp, removed from the pan and then some shredded savoy cabbage cooked in the bacon fat and a knob of butter. 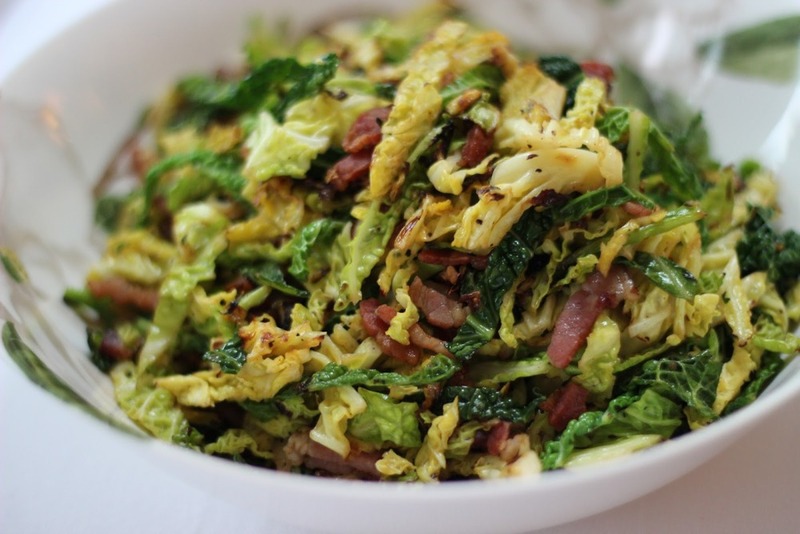 The result is al dente cabbage that is dark at the edges and has a smokey undertone – very nice indeed. Remove one of the pastry rolls from the fridge. Into a slow cooker place the beef, Guinness, carrots, onion, celery, bay, sugar, Worcester sauce and a generous grind of pepper, cook on a medium heat for around 3 hours – or until the meat is tender and you can break the chunks with a spoon. Once the pie contents has been on for an hour, take your pie dish and roll out one of the sheets of puff pastry until it’s about the thickness of a £1 coin. Drape it into the dish and using your knuckles gently let it sink into the edges (you don’t want it to tear) leave some pastry hanging over the edge of the edge of the pie dish because it will shrink when cooked, and then place it into the fridge for a couple of hours. Strain the slow cooker contents through a colander once ready, catching the liquor – put the liquor on the hob on a medium heat and bring to the simmer for around 10 minutes, add several scrunches of sea salt to taste, but you’ll be surprised at how much it needs. Whilst this is happening, remove the onions and bay leaves from the colander and discard. Preheat your oven to 200°C and take the other pastry roll out of the fridge. Gradually pour the cornflour mix into the liquor on the hob and stir thoroughly, do this gradually until you’re happy with the thickness of the liquor, but you shouldn’t need more than the three tablespoons you’ve made up. Cook the liquor for around 5 minutes then add the steak, carrots, celery and diced black pudding to the pan, turn off the heat and leave there to settle. Take the pie dish from the fridge and put some baking paper in it, weighed down with baking beads or dry rice, then bake for 10 minutes. Remove from the oven and using some kitchen scissors or a very sharp knife, slice the excess pastry off that is now hanging below the edge of the pie dish. Take the baking beads / rice and baking paper out of the centre of the dish and put the dish back into the oven for 4 minutes. Remove from the oven (and don’t be scared, I know it all looks puffed up) leave it a couple of minutes to settle a little, then carefully using the back of a wooden spoon, press the base of the dish back down. Take your pastry and roll it to around the thickness of a £1 coin, baste the pastry edges of the dish that has been cooked with the whisked egg, and then drape the rolled out pastry over the top, gently press the edges down with your fingers so they’re firmly connected, and using a sharp knife remove the excess pastry. Now carefully score a cross pattern over the pastry, being careful not to peirce it, before cutting a hole in the centre for the steam to escape, and brushing it with the beaten egg mix. Pop it into the oven for around 40 minutes, until the pastry is a deep golden brown and when you spear the centre, the knife comes out hot hot hot. Serve with your vegetable of choice.